Although they do require moisture, Astilbe plants are not that difficult to grow if you prepare the soil well and have a shady position. If you do you will be rewarded with fantastic flowers and attractive ferny foliage. Flowering season is late spring to summer and this is also the time that the foliage is at its best. Depending on variety flower colours range from white through to red and purple, they also vary in height, from low growing to tall majestic species that add height to the border. Sometimes known as ‘False Goats Beard’ astilbe have feathery foliage and colourful plume like flowers rising above the foliage during early summer. Astilbe chinensis ‘Fireberry’, pictured right, is a low growing variety, well suited to containers. Most varieties are considered to be a partial to full shade plant, they do appreciate a little morning sun with protection from the hot afternoon sun. Astilbe are a plant that requires moisture and protection from the hot sun. Choose a position with protection from hot sun. Dig in some well rotted compost, a little blood and bone and some aged manure. Ensure good moisture from spring through summer, however not waterlogged conditions. A position by the side of a shaded pond is ideal. Constant water logged soil is not. 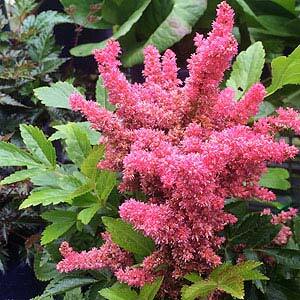 Astilbe will grow from 40cm to 90cm depending on variety and given the right conditions. Soil that is rich in organic matter, and reasonably moist at all times will suit astilbe, so consider some water crystals placed in the root zone of plants when planting. If you can provide moist shaded conditions Astilble are one of the most colourful woodland plants. Although some are more tolerant of drier conditions than others, none rely grow well in dry soils, so before you plant them amend the soil. Start by digging the soil over well, to a good depth of around 30 cm (12 inches). Then dig in good amounts of compost and coir peat. In very dry or free draining soils you may wish to create a bog garden. These are a long lived plant and after a number of years established clumps can be divided. A few species have been available for sale in Australia for a number of years, recently new varieties have been imported and today we have access to a wide variety. Astilbe plants are available for sale from the following nurseries.